Warren Beatty’s 1981 film, Reds, tells the story of John Reed and Louise Bryant, two American journalists who were witnesses to the Russian Revolution. Beatty wrote the screenplay with Trevor Griffiths. Watching this film, one is impressed by the personal courageousness of Reed and Bryant, as well as by their commitment to social justice. They were interesting and inspiring people, so I wish I could give this film an unqualified endorsement, but unfortunately it has a number of problems with it. At nearly three hours, Reds is too long, mainly because the first half largely consists of scenes of Reed (Warren Beatty) and Bryant (Diane Keaton), who were married, bickering with each other, as well as scenes of Bryant having an affair with Eugene O’Neil (Jack Nicholson). The film doesn’t get interesting until about halfway through when Reed and Bryant go to Russia. Beatty and Griffiths seemed to have had trouble making convincing characters out of historical figures. O’Neil, for example, mostly just drinks a lot and glowers at people. It’s hard to see why Bryant is attracted to him. Lenin and Trotsky appear only briefly. Zinoviev (Jery Kosinski) and Radek (Jan Triska) are the only Bolshevik leaders depicted in any detail. Reed’s feud with Zinoviev provides much of the drama in the second half of the film. Zinoviev comes across as a bit of a bully and somewhat dishonest, although personally brave. Reed, on the other hand, comes across as a bit ultra-left. He opposes the idea of communists trying to work within the American Federation of Labor, for example. Unfortunately for the film, their conflict is left unresolved because of Reed’s untimely death. Reds does not romanticize the Russian Revolution. There are discussions about the collapse of the Russian economy and the high-handed methods of the Bolsheviks. Yet the film also points out that sixteen foreign armies (including the U.S. army) invaded Russia. This is a point that often gets conveniently ignored in discussions about the Russian Revolution. Beatty does possess skill as a director. The scene in which Bryant’s home is raided by government agents, for example, is effectively done, as is the scene in which White Army soldiers attack a train on which Reed is traveling. The film includes interviews with “witnesses”, people who knew Reed and Bryant. Most of their comments are unilluminating, and some are downright inane. (George Jessel is inexplicably allowed to sing.) They mostly serve as a distraction from the story. I think the film would actually have been better if these had been left out. 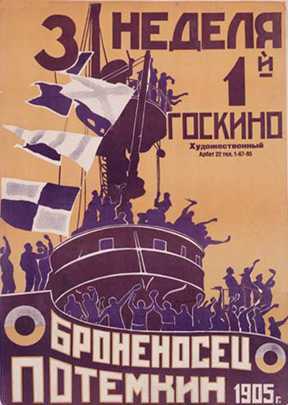 Sergei Eisenstein’s 1925 film, Battleship Potemkin, is loosely based on an actual incident in Russia’s 1905 revolution. The crew members of the Potemkin, which took part in the recent Russo-Japanese war, are given rotten meat to eat by their officers. When the captain finds out about this, he threatens the crew with severe punishments. He has a group of sailors rounded up, and he announces that they will executed as an example. A squadron of marines raise their rifles, but the sailors persuade them not to shoot. The sailors overpower the officers and throw them overboard, but one officer manages to shoot and kill Vakulinchuk (Aleksandr Antonov), the leader of the mutiny. The sailors take his body to the nearby port of Odessa, where it is put on public display with a sign reading “Killed for a bowl of soup.” The townspeople support the sailors, with the exception of a small group of men who shout, “Kill the Jews!”, but they are shouted down. Soldiers show up and open fire on the townspeople, killing many of them. The sailors of the Potemkin retaliate by opening fire on the soldiers. The sailors learn that a naval squadron is coming to help the soldiers. They get together to decide what they should do. There are strong disagreements. (Some things never change.) They eventually decide to sail to meet the squadron. They will try to persuade the other sailors to join them. If that fails, they will almost certainly die, since they are outnumbered. They go to meet the squadron. They signal to the other ships, but they get no response. They load their guns and get ready to fire, but just then they receive a signal that the other ships will join them. The sailors rejoice. Eisenstein clearly meant Battleship Potemkin to be propaganda. During the scene when the sailors are about to be shot, for example, we see numerous close-up shots of officers grinning ear to ear in eager anticipation of what is about to happen. And yet this film somehow manages to be something more than that. The massacre seen on the Odessa steps is extremely powerful to watch. It is impossible not to be moved by it. Eisenstein used this scene to test his theories about the use of montage in film. (The massacre did not happen in real life. Nor was it in the script. Eisenstein and the cast and crew improvised it on the spot.) Battleship Potemkin manages to be not just propaganda, but art as well. 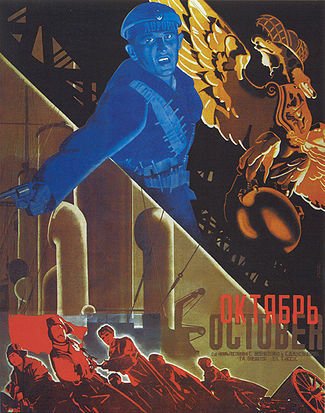 Eisenstein’s 1928 film, October, is a commemoration of the tenth anniversary of the Russian Revolution of 1917. (It is also known as Ten Days That Shook the World, although it is not actually based on John Reed’s book.) The film is shot in a documentary style. (I remember seeing it on TV as a child. I thought I was watching actual film footage of the Russian Revolution.) Many of the people we see actually took part in the revolution, and the scenes were shot in places where the fighting took place. Despite these efforts at authenticity, this film is basically propaganda. During the Kornilov coup, for example, we see Kerensky hiding underneath pillows. We also see Bolshevik soldiers smashing bottles in the Tsar’s wine cellar. According to Victor Serge, the soldiers drank the wine and got stinking drunk. The storming of the Winter Palace is fun to watch, but it doesn’t have the same emotional power as the massacre scene in Battleship Potemkin. 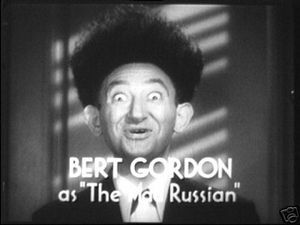 Also, Eisenstein used this film to test out a type of montage he called “intellectual montage”, in which a series of unrelated images are shown to illustrate an idea. We are shown a Russian Orthodox priest, and then a series of images of Buddhist, Hindu, Chinese, and Aztec sculptures. This is meant to be an attack on religion, but it doesn’t succeed, unless you think there is something inherently objectionable about sculpture. Before this film was released, Eisenstein was forced to cut out a number of scenes that had Trotsky in them. Trotsky had just been expelled from the Communist Party. The irony here is that in commemorating the revolution, October marks the beginning of the counterrevolution.